Long before Lynnwood, Washington became home for one of the newest locations for Chick-fil-A’s ongoing expansion to the Pacific Northwest, the city already had chicken in its DNA. Lynnwood, formally known as Alderwood Manor, was built on the chicken industry, which was the driving force for the city’s early economy. At one time, the number of eggs produced in Alderwood Manor each year would, if laid end to end, stretch from New York to San Francisco. The community of Alderwood Manor came to fruition in 1917, after Puget Mill cleared 7,000 acres of land and started marketing the area as an agricultural haven to communities as far away as New York. Puget Mill developed a 30-acre demonstration farm. Billed as a “Free Poultry College,” the farm was a real estate marketing success, attracting city folks and settlers looking to “drink in the uncontaminated invigorating fresh air of the countryside,” while learning about farming and raising chickens on their five and ten-acre tracts. “The purpose of the demonstration farm was to show prospective buyers how to raise poultry for egg production and how to grow nuts, berries, vegetables and other cash crops to make a living off their land,” said Cheri (Stadler) Ryan, president of the Lynnwood-Alderwood Manor Heritage Association and Museum (LAMHA). 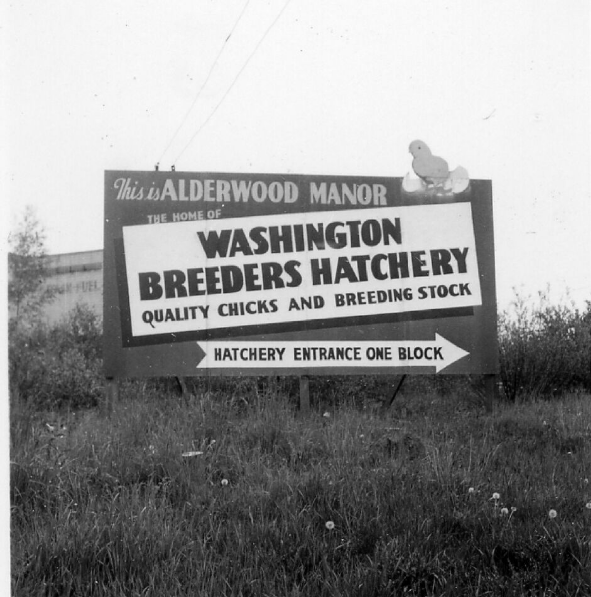 In the early 1920s, Alderwood Manor was the second highest egg-producing community in the nation. The farm was built on the Seattle Everett Interurban Trolley line, ensuring access to markets. Today, residents know the area as the corner of 196th SW and I-5. With the help of a national advertising campaign, Puget Mill pulled in gentlemen farmers, which they dubbed, “Little Landers,” and told their stories of homesteading without hardships in its company newspaper. The result? The population of Alderwood Manor went from 22 people to 1,463 people and 200,000 hens in just five years. 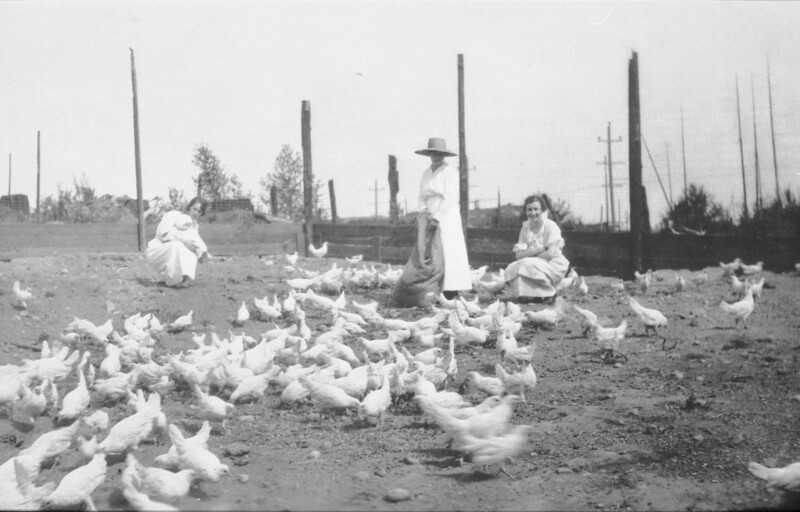 Jan (Canfield) Nofziger, a volunteer at LAMHA, knows about Lynnwood’s hen-filled past from personal experience; she grew up on a three-acre chicken farm in Alderwood Manor. Her father moved his family there in 1948 from Seattle to pursue his dreams of becoming a gentleman farmer. As the oldest of four girls, Jan remembers helping her mother “candle” eggs, (using candlelight to see if the embryos are forming correctly), and ordering chickens by mail to populate their 100-chicken-sized coop. Recalls Nofziger, “The chickens would arrive in cardboard boxes with holes in them and we would pick them up at Bill Geltz’s feeding store. Since they were chicks, we kept them in the living room until they were large enough to move into the chicken house, which I know my mother didn’t like.” Nofziger’s family and all of their farm animals lived on Beech Road, which is now the part of the parking lot in front of Kohl’s in the Alderwood Mall, the largest outdoor shopping center in the region and Lynnwood’s largest attraction. “You’ll see where they pay homage to their chicken roots with bronze life-size chicken statues eternally clucking between the reconstructed supervisor’s cottage and the Wickers Building." Today, the all-volunteer LAMHA and the City of Lynnwood have managed to preserve a few buildings from the Alderwood Manor community in the Lynnwood Heritage Park. 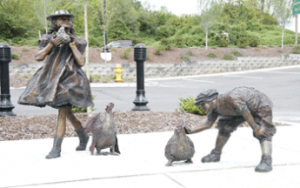 There, you’ll see where they pay homage to their chicken roots with bronze life-size chicken statues eternally clucking between the reconstructed supervisor’s cottage and the Wickers Building, which was the first mercantile and post office in Alderwood Manor. Almost 100 years after the area was raised on chickens, Chick-fil-A is proud to call Lynnwood home.